Rhetorical aim is the key to good writing. A unique aims/purposes-based developmental writing program, IDEAS & Aims for College Writing fulfills a growing need in our classrooms for a different approach to teaching writing—one that emphasizes rhetorical purpose and college-level critical thinking and reading skills. A consistent focus on subject, purpose, audience, and genre leads students to effectively analyze writing situations they will encounter in their classes, helping them to see writing not only as an important academic tool but as a necessary skill for their personal and professional lives. Throughout, the use of an easy-to-remember template called IDEAS [Interest, Details, Explanation, Audience, and Style] prompts students to analyze readings, thus generating content for paragraphs, essays, and professional documents. 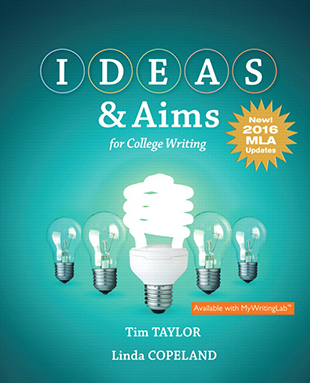 IDEAS & Aims for College Writing is fully integrated with MyWritingLab™, an online homework, tutorial, and assessment program designed to work with this text to engage students and improve results.